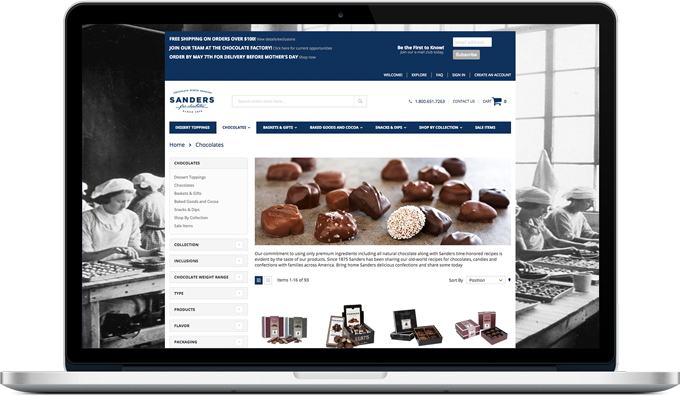 Sanders Candy, a Metropolitan Detroit-based cornerstone in the confectionery world, has been developing and delighting customers with premium chocolates, ice cream, dessert toppings, and baked goods since 1875. 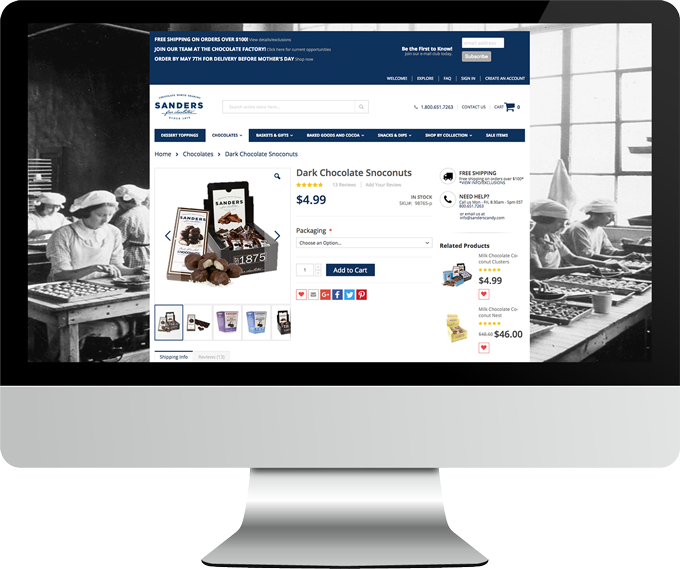 Today, Sanders products can be found in multiple retailers across the United States, at Sanders Chocolate & Ice Cream Shoppes in Michigan or online at www.SandersCandy.com. Sanders’ website is a popular online method for consumers around the world to place orders and send gifts; it is an integral component of the company’s eCommerce strategy. But as the online shopping industry grows rapidly and users are utilizing a variety of devices to shop, Sanders realized their eCommerce website was holding back their business potential. Sanders’ website was so highly customized on the Volusion platform that it prevented the site from being responsive and admin users had a difficult time updating and maintaining the online catalog. This resulted in frustrated visitors, poor user experience, and little potential for online sales growth. Logic Solutions helped Sanders replatform their site from Volusion to the newly released Magento 2. First, Logic created a site based on Sanders’ site designs and customized the look and feel to fit their branding strategy. Logic migrated the product and customer data from Volusion to Magento, and cleaned up the wealth of legacy and inaccurate data with scripts to ensure they would import correctly. discounts for orders values above a certain amount. 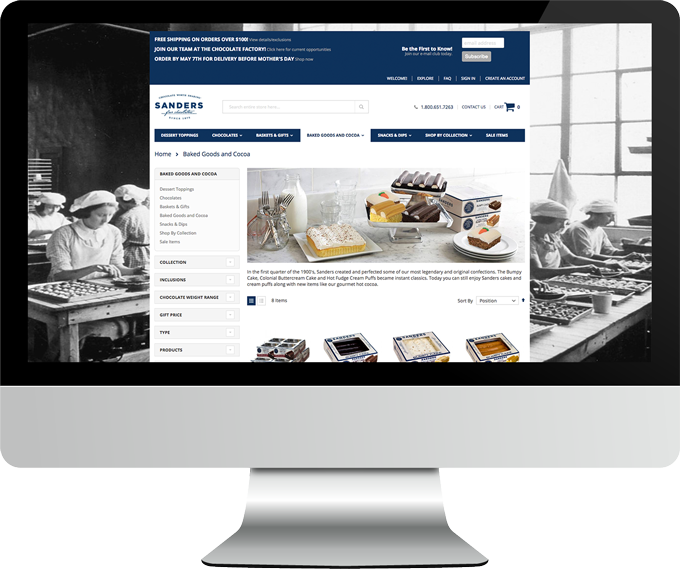 In summary, Sanders’ new Magento website was developed with responsive web design in mind to provide a better experience for shoppers, increase revenue from mobile sales, and empower Sanders to better manage their eCommerce content in a timely manner. With mobile traffic being an important shopping factor for the many holiday seasons, we’re looking forward to seeing Sanders grow and expand their business. Looking for a custom web solution? Let’s get started.